The Rifter® #54 is at the printer! 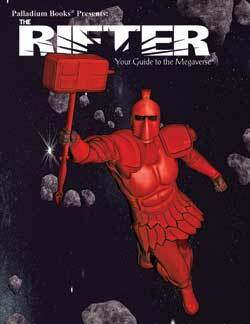 Yep, another great issue of The Rifter® #54 is done and at the printer. There is a wealth of fun information in this issue. A Heroes Unlimited™ adventure, Palladium Fantasy RPG® monsters and races, the Rifts® city of Chillicothe, a Nightbane story and the final chapter of The Hammer of the Forge, plus news and other good stuff. Rifts® Dimension Book 14: Thundercloud Galaxy™ is almost finished as well! We plan to get it the printer next week, before the Creators Conference (only one week away!). We'll all be working through the weekend to get it finished and to the printer. No time for a birthday! Gotta finish Thundercloud Galaxy™ (which is going to be epic) and prep for the Creators Conference (which should be pretty awesome all by itself). This means there just isn't time to celebrate my birthday on Saturday. Okay, I might take the evening off after eight hours at work, but that's it. We'll probably celebrate my birthday with Julius' (his is April 7), sometime after the Creators Conference like April 14th. Wayne is the next birthday boy (May 1), with Kathy, Alex and Thom all in June. Yeah, we're all clustered together. Back in Print and Ready to Ship: The following out of print books arrived at the Palladium warehouse last week and are ready to ship. Rifts® Baseball Caps are back due to popular demand and in the warehouse waiting to ship. Online sales. Sales have been scary bad this week. March and April are often the worst months in sales, especially without a new release. April should pick up with the release of The Rifter® #54and Rifts® Thundercloud Galaxy™, both scheduled to ship next month. And they will be followed in short order by more new releases all Spring and Summer. Palladium Website. We've all been so busy working on books and other things that none of us here have even checked in with Rex Barkdoll or Thom Bartold in the last week. Sorry guys. I'm hoping it goes live sometime in April. Join Palladium on Facebook. The Palladium Facebook page continues to be a fun place to visit, chat and have fun and we invite you to join us. More features and interaction are coming. Our new "tech guy," Rex, has other ideas for us as well, so expect to be seeing us all over the Web in the months to come. Social media, watch out! We're working hard to get books out, so I'm keeping this short. Game on. Palladium Books will be at Gen Con Indy this Summer – August 4-7, 2011. Please come on over and join the fun. Palladium has not attended Gen Con in a couple of years, so we figured it was time to return. We heard the event was fantastic last year, we'll have a bunch of new product, and it is a chance for us to meet and chat with fans from around the world. Besides, it is Palladium's 30th Anniversary so it seems appropriate to be there. $11.95 retail – 96 pages – Cat. No. 154. Ships April 14. In the final stages of production. 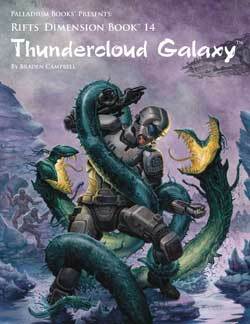 The Thundercloud Galaxy is a place for action and adventure. It is where the Dominators still tread and where the last of the Elder Races are said to hide. Ancient ruins of the Elders and other advanced people litter the worlds of the Thundercloud Galaxy. Some hold the secrets to riches, others threaten to unleash forgotten technology and ancient menaces. Colonization efforts in the Thundercloud sponsored by the civilizations in the rest of the Three Galaxies offer the promise of a new beginning and a glorious future. Colonists flock to the Thundercloud filled with dreams. Space Pirates and an array of cutthroats also flock to the galaxy, guns in hand, ready to rob and fleece the colonists. Lawmen and heroes are in great demand, and the opportunities for clever adventurers are said to be without limit. Strange beings like the feline Shing, insectoid CheDive, and Whetu, who defy description, and monsters like the devouring Yboorare just the tip of the proverbial iceberg when it comes to life in this galaxy. It is also home to the Bushi Federation and the Splugorth Kingdom of Desslyth, and is a playground for space pirates, raiders, the mysterious Exiles and the dark forces of the Minion War. As the civilizations of the Anvil and Corkscrew Galaxies scramble to colonize the Thundercloud Galaxy in a mad rush to grab as much as they can, they are beginning to realize the galaxy holds more riches, beauty, horrors and secrets than anyone has ever imagined, making it a place of discovery, adventure and treachery like no other. Thundercloud Galaxy™ is a perfect companion to the rest of the Phase World®/Three Galaxies™ based Dimension Books™ as well as the Minion War™ series. Players can be pirates, raiders, brigands or hired guns, or they may be explorers, adventurers, Spacers, or any number of heroes trying to protect the colonists or the indigenous peoples of countless worlds and colonies. The possibilities are truly limited only by your imagination. Mysteries of the Elder Races, complete with stats for them as NPCs. Notes on the Dominators and Gene-Tech. Notable Dominator weapons, gear and salvage available to players. Notable monsters and strange creatures. Notable weapons, colony ships and equipment. The Trensik Mercenaries, Elder Races, Dominators and more. The Exiles, Splugorth Kingdom of Desslyth and other mysterious people. - The Rifter® #54 – New – April 14. – Additional titles may be back in print.